bemanistyle.com: We’ve noticed an absence of the Xbox 360 & PlayStation 3 DDR games that were announced last year. Are these titles still in development and why are they not present? Naoki Maeda: We announced these titles last year, but at the moment we’re not ready to say anything more about them. We are focusing internally on making things innovative and new, and are looking for even more new ideas for these titles. They are still being developed. BMS: In Japan Bemani titles have stopped being released for the PlayStation 2, and in cases like pop’n music and GFdm we haven’t seen a console release in some time. Are there plans to take these titles to current generation consoles? NM: My team has separated from the Bemani team. As you know, in the past several years the US has seen many more music games. Because of this, we want to create new experiences based on our original concepts rather than competing with the existing games. We are looking at many new ideas and concepts for Rock, DJ and Dancing type music games. BMS: We noticed that you have a big role with Konami’s new “Dance Masters” title. Are you still going to act as producer for DanceDanceRevolution? NM: DDR was my first music game, so it is very important to me. I will still continue to produce these games while working on new concepts. BMS: The balance board mode that was introduced last year is missing from the show floor. We’ve been told that it is still in the game, but are you planning any new features or uses for it? NM: Yes, it will be available. You’re limited on the balance board to movement with the lower body, and we’ve done a good job with that already so now we are trying to include upper body movement with that. You can see on the show floor that we have added directional movement, and more upper body movement with the Wii Remote and Nunchuk. BMS: Speaking of upper body movement, have you considered using the Wii Motion Plus or 2 Wii Remotes for single players to enhance the motion detection? NM: We have considered it, but as you noticed we’ve added some motion detection already. There are of course more possibilities, and we are looking at them. BMS: In America, user customization is a popular concept for music games. You still hear a lot about StepMania and In The Groove because of the amount of freedom and creation these titles give you. Have you ever considered doing a contest to allow players to create their own steps for DDR that could be used at the official chart in the final game? NM: We’ve done something like this in the past, and it’s something we didn’t really consider after the one time. There are many ideas to give players more control of the game, and many possibilities for us to explore in the future. BMS: I couldn’t help but notice the inclusion of “Night Of Fire” in Dance Masters. This reminds me of Konami’s “ParaParaParadise” series, did you draw any inspiration for the title from those games? NM: Yes, I’ve done some work on the ParaParaParadise series, as well as other Bemani series. I have that experience with the games, but did not get inspiration from those titles for Dance Masters. As you know, my team is no longer a part of Bemani, and so we are not thinking about Bemani titles, or part of that family. Dance Masters is like the first of our ideas for the next generation of music games. BMS: Some Konami Original tunes are included in the demo on the show floor. Are there any chances for songs from Bemani games, like She Is My Wife or Daisuke, to be included in Dance Masters? What about other licensed music? NM: This is a difficult question, there are many things about Kinect that we did not discover until recently, like the release date. So the songs on the show floor are what we were prepared to show. We are still considering many other songs, and some license tracks for the game, but we are not ready to discuss them at this time. BMS: Do you plan to release Dance Masters in Japan? NM: Yes, we are currently discussing this. Although, Dance Masters is transcending the Bemani series, it is something new and separate. BMS: We noticed that songs like “A Geisha’s Dream” had a full dance routine. Do you have someone on staff creating these routines, or are you outsourcing them to a studio like you did with Twinstar for the ParaPara routines? NM: We have professional dancers and choreographers from all over the world creating the routines for Dance Masters. BMS: Has there been any discussion regarding an Arcade version of Dance Masters for the US or Japan? NM: This is my personal opinion, but I would love to see Dance Masters made into an Arcade game. I think the gameplay matches very well with the arcade scene and atmosphere. BMS: We had a chance to check out the community features being used in Def Jam Rapstar, such as submitting videos of yourself performing songs. Are there any plans to do something similar with Dance Masters? NM: The game’s director, Kengo Suzuki, can answer this better. Kengo Suzuki:We were thinking about doing that for this version of the game originally, but we are doing so many new things with the game that we had problems transmitting the data from the game for something like that. Although we did work it out so when you play online, the image of you playing will be shown in real time on their screen. You’ll also be able to make a custom friends list just for this game. For the next version we do want to look at recording gameplay and letting users upload it to something like YouTube or Facebook. BMS: Last year you attended Japan Expo and showed off the pads for the Xbox 360 and PlayStation 3 DDR games. Are there any plans to show off DDR X2 or any new titles there this year? NM: DDR X2 will probably not be there, but we do have a surprise that we plan to show. BMS: Now that you are the producer for DDR and Dance Masters I can only imagine that you are very busy. How do you find the time to do all of this while still making new music for your games? NM: (Laughs) I do it all by not sleeping! BMS: That being the case, how do you stay so energetic!? NM: Red Bull (Laughing) and vitamins. BMS: In the recent years, many Bemani artists have released albums on Beatnation Records. Are there any plans for you to create an album in the same manner? NM: Beatnation Records is like a label, I am not a part of this. If I create an album I would like it to be a worldwide kind of thing. I would also like to create a full version of all of my (200 something) songs and then pick my favorites to be included in an album. BMS: Speaking of global release, has there ever been any talk of releasing the DDR soundtracks worldwide through iTunes or even on compact disc? NM: I think about that all of the time myself as well, but I don’t believe Konami has the infrastructure to pull it off. BMS: Do you think there could ever be a chance for something like the pop’n music Live or Beatnation Summit concerts in America? What about appearances at conventions? NM: I think many of us would like to do it, but we’ve never really had the resources or a chance to do it. I’d love to attend a convention, but I’ve never really been invited directly. BMS: Given that you’ve worked on both types of games now, do you think that peripheral based games still have a strong future in America? Or will motion control take over? 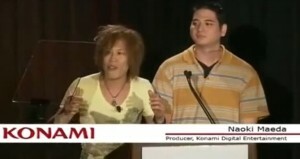 NM: At Konami, we created GFdm, IIDX, DDR and these games created the atmosphere of playing an instrument or dancing. In America, games like Rock Band, DJ Hero and Guitar Hero made it feel more real while still being a game. We are trying to create an even more real experience while still being the most fun possible, so we would like to be flexible. We would also like to collaborate in the future with famous producers and musicians to make music exclusively for our games. BMS: Finally, do you have anything you’d like to say to your fans? NM: Dance Masters is a new starting point for us, we hope that everyone will give it a chance and at least try it once! We hope that DDR fans will continue to keep an eye on our work and tell us how we’re doing. There are communities online, and now I even have my Facebook page so fans can tell me how we are doing and give us suggestions of how to improve so we can appeal to everyone. I would like the fans to keep track of what we’re doing! I love the US! And we haven’t forgotten about DDR, I will continue to work on DDR because it was my starting point. It is very important to me. I would like to keep creating it forever, so please expect new things for DDR as well!